real-time data for our remote clients. Makai Ocean Engineering, Inc. is now providing expanded corrosion services at their Marine Corrosion Laboratory (MCL) in Kailua-Kona, Hawaii. The MCL is located at the Natural Energy Laboratory of Hawaii Authority (NELHA), making it the only location in the U.S. where large flows of shallow and deep seawater from depths up to 3,000 feet are continuously available. The MCL is staffed with corrosion engineers and state-of-the-art equipment for a wide range of research, development, testing & evaluation (RDT&E) services in the field of marine corrosion. Capabilities at the lab include both basic corrosion science research and applied engineering solutions for the prevention of marine corrosion, and are complemented by a strong relationship with researchers at the University of Hawaii’s Hawaii Corrosion Laboratory. The original focus of the MCL was developing marine heat exchangers. Under a contract with the Hawaii Natural Energy Institute, sponsored by the Office of Naval Research and the Department of Energy, corrosion engineers at the lab were tasked with identifying novel alloys and manufacturing methods for heat exchangers that would be corrosion-resistant, low-cost, compact, and highly efficient. Samples of both ferrous and non-ferrous alloys made with various joining and manufacturing methods (brazed joints and friction-stir welded joints) as well as various surface conditions (rolled, machined and extruded), have been tested at the MCL since 2009. In addition, several innovative corrosion prevention pre-treatments, coatings, and techniques have been developed specifically for marine heat exchangers that are exposed to shallow or deep seawater. The lab is now working with commercial and defense clients on testing the effectiveness of coatings that are intended for diesel storage tanks, marine pipelines, and ship hulls. 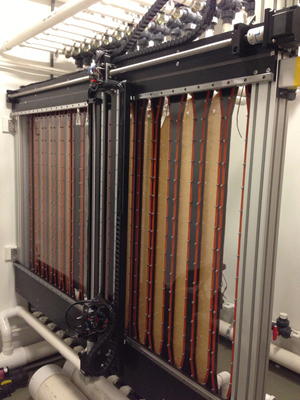 The MCL features an automated corrosion monitoring system that collects electrochemical, ultrasonic, and laser profilometry data, as well as high resolution time-lapse photos, of in-situ samples. These data are available to clients in near-real-time via the internet. Combined with image recognition software, the facility provides real-time knowledge of sample variance and automatic detection when samples are starting to corrode, as well as a detailed time history of the corrosion process. Makai also provides destructive testing and materials characterization, and outsources standard services for metallographic imaging, scanning electron microscopy, and X-ray tomography in order to provide clients with a convenient full service and cost effective research program. other NACE, ISO, ASTM, and in-house tests and evaluations. Makai Ocean Engineering, Inc. is an innovative ocean engineering and design firm based in Hawaii, USA since 1973. Makai’s expertise includes submarine cable software and services, marine pipelines, Seawater Air Conditioning (SWAC), Ocean Thermal Energy Conversion (OTEC), underwater vehicles, and general marine engineering and R&D. Please visit makai.com for more information.